During a fiery rally in Michigan yesterday, president Donald Trump renewed his attack on the House Intelligence committee chairman, Rep. Adam Schiff. To applause from an energized crowd, Trump mocked his appearance by saying he had “the smallest, thinnest neck I’ve ever seen.” It was the president’s first political rally since the end of the 22-month Russia investigation, which was led by special counsel Robert Mueller. During one segment of his speech, Trump blasted Democratic Party officials and the media for consistently focusing on alleged collusion with Russia. A 4-page summary produced by Attorney General William Barr said the final report found no evidence Trump or his campaign conspired with Russia to influence the outcome of the 2016 presidential election. Mueller declined to draw a conclusion on obstruction of justice. Trump said: “Many many people were badly hurt by this scam but more importantly our country was hurt. Our country was hurt. And they are artificial respirators right now. “They did it all because they refuse to accept the results of one of the greatest presidential elections, probably number one, in our history,” Trump added. Earlier this week, Trump demanded Schiff leave his position. “Congressman Adam Schiff, who spent two years knowingly and unlawfully lying and leaking, should be forced to resign from Congress!” he tweeted, in a post shared nearly 40,000 times. Yesterday, nine Republicans on the House Intelligence Committee signed a letter calling for Schiff’s resignation—a suggestion met with a lengthy and defiant speech by the chairman. “Your actions both past and present are incompatible with your duty as chairman of this Committee… we have no faith in your ability to discharge your duties in a manner consistent with your constitutional responsibility,” the Republicans’ letter stated. 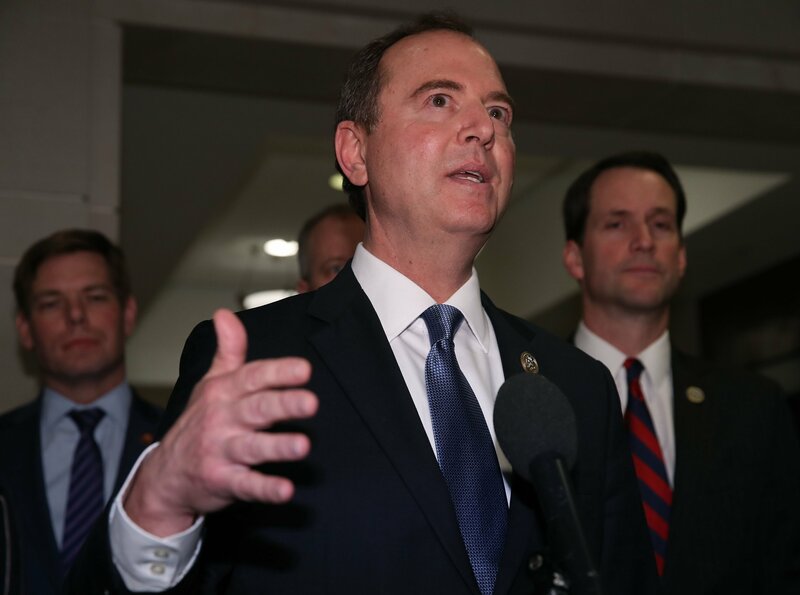 In the often testy exchange between House politicians, Schiff said: “I have always said that the question of whether this amounts to proof of conspiracy was another matter.